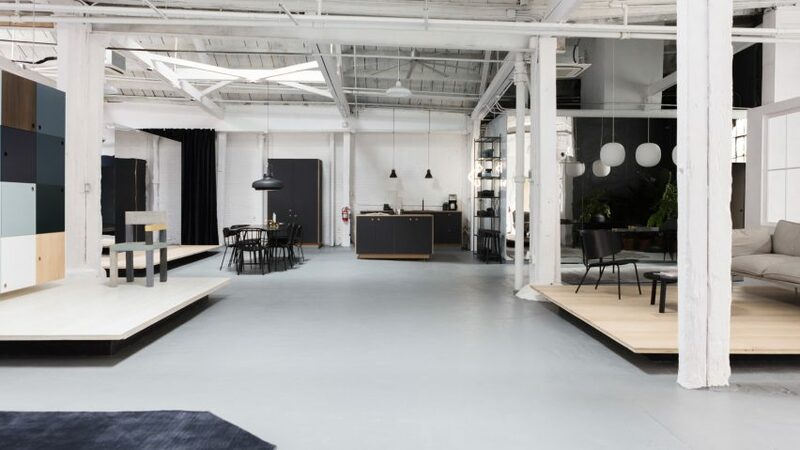 Danish brand Reform and US flooring company Madera have transformed a 1940s warehouse outside the Brooklyn Navy Yard into a Scandinavian-influenced showroom that displays hacked IKEA kitchens. Reform, which specialises in customising IKEA's Metod and Sektion kitchen cupboards, shares the 22 Waverly showroom and offices with Madera. The partnership was formed after Madera chose to install Reform's Basis 01 kitchen in its new showroom and office. The duo then decided a collaborative space would be a more fruitful way to showcase both products. Described as a Scandinavian hub, the open-plan showroom pairs the wooden floors and kitchens in a series of sets, which are styled with products from one of the 28 Scandinavian design brands chosen by Reform. "We experienced many requests from the US, so it made perfect sense for us to open a showroom in the States," Reform told Dezeen. "Then we found Madera, nice guys and beautiful floors. The only right thing was for us to collaborate with them, and bring 28 of the best Scandinavian design brands with us." "Our thought was to come here as an American and get a taste of Denmark/Scandinavia," the company added. The 4,000-square-foot (371-square-metre) former warehouse is located outside Brooklyn Navy Yard, a former shipbuilding complex between the Dumbo and Williamsburg neighbourhoods that is undergoing extensive regeneration. The interior was stripped back to reveal skylights, brick walls and high-vaulted wood-lined ceilings. Most of the surfaces are painted white, while some are coloured grey to create a neutral backdrop for the sets. "In a week we coloured the floors, painted in beams, the walls and styled everything," Reform said. "The styling represents a Scandinavian feeling and a Nordic way of living." Reform is showcasing its collaborations with some of the biggest names in Danish architecture, including Henning Larsen and Norm, which have customised the IKEA kitchens. In a dark and moody set, architect Sigurd Larsen's cabinet design in aluminium is complemented by dark parquet flooring, and a black dining table and clothes rack by Million. The minimal IKEA hack by Copenhagen-based Norm Architects' forms the centrepiece of another set, featuring sawn smoked oak fronts. Other vignettes include a cabinet with 1950s colours paired with a block-coloured chair from New Works, while the functioning kitchen features a table by Ferm Living, topped with a pendant from Danish brand &tradition. The showroom also features a workshop for making prototypes and a small art gallery, named Cooler Gallery, which set in a former butcher's cooler. Reform offers drawer and cabinet fronts as well as countertops to provide customers with more options for the furniture giant's simple design. It has also collaborated with BIG, the Copenhagen and New York studio led by Bjarke Ingels, which added handles made from car seat belts to the kitchen cupboards. Madera's sustainably sourced collection of finished hardwood, and reclaimed wood floors and wall surfaces are all designed in Brooklyn and locally manufactured. Featuring a Scandinavian aesthetic, the products have been used by BIG and New York studio Yabu Pushelburg. The duo's showroom opened last week to coincide with New York's citywide NYCxDesign festival, taking place from 3 to 24 May 2017. IKEA hacks are becoming increasingly sophisticated, as brands realise the demand for upgrading the cheap units. Earlier this month, startup company Plykea launched a series of birch ply doors and worktops that can be attached to the Metod kitchen cupboards. Photography is by Gustav Risager.